CHINA LIAONING DINGXU ECOLOGICAL AGRICULTURE DEVELOPMENT, INC.
Room 2119 Mingyong Building, No. 60 Xian Road. Indicate by checkmark whether the registrant is a large accelerated filer, an accelerated filer, a non-accelerated filer, or a smaller reporting company. See the definitions of “large accelerated filer,” “accelerated filer,” “non-accelerated filer,” and “smaller reporting company” in Rule 12b-2 of the Exchange Act. The aggregate market value of the voting and non-voting stock (1,750,000 shares of common stock) held by non-affiliates of the registrant, as of June 29, 2012, was approximately $122,500 computed by reference to the last reported sale price of $0.07 per share on June 29, 2012. All executive officers and directors of the registrant have been deemed, solely for the purpose of the foregoing calculation, to be "affiliates" of the registrant. As of May 1, 2013, 46,450,000 shares of common stock, $0.001 par value, were outstanding. As of March 31, 2013, there were 66,450,000 shares of common stock, $0.001 par value, issued and outstanding. The decrease in the number of total issued and outstanding common shares was due to the cancellation of 20,000,000 shares by Chin Yung Kong, our controlling shareholder, on January 8, 2013. Market for Common Equity, Related Stockholder Matters and Issuer Purchases of Equity Securities. (iv) Liaoning Dingxu Ecological Agriculture Development Co., Ltd.辽宁鼎旭生态农业发展有限公司, a limited liability company organized under the laws of the People’s Republic of China and an affiliated entity of Panjin Hengrun through contractual arrangements (“Liaoning Dingxu”). “China” or “PRC” refers to the People’s Republic of China, excluding Hong Kong, Macau and Taiwan. “GAAP” unless otherwise indicated refers to accounting principles generally accepted in the United States. “RMB” or “Renminbi” refers to the legal currency of China and “$” or “U.S. Dollars” refers to the legal currency of the United States. We make no representation that the RMB or U.S. Dollar amounts referred to in this report could have been or could be converted into U.S. Dollars or RMB, as the case may be, at any particular rate or at all. We were incorporated under the name “Hazlo! Technologies, Inc.” on August 19, 2010 in the State of Nevada. Our initial business plan was to modify and translate software and web applications originally written in English into Spanish and to focus on the needs of the Arizona business community to better serve the Spanish-speaking population. We did not generate any revenue from the said IT and data translation services. On December 12, 2011, we entered into a Share Exchange Agreement with DingXu BVI Shareholder (Chin Yung Kong) under which we issued 60,000,000 shares of common stock to Chin Yung Kong to acquire 100% of the issued and outstanding shares of DingXu BVI. Upon closing of the Share Exchange transaction, DingXu BVI became the wholly owned subsidiary of Hazlo! Technologies, Inc.
China Liaoning DingXu Ecological Agriculture Development Co, Ltd., a BVI company (the “DingXu BVI”) was incorporated under the laws of the British Virgin Islands on April 15, 2011. Chin Yung Kong was the sole shareholder and director of DingXu BVI. On July 5, 2011, DingXu BVI formed Panjin Hengrun Biological Technology Development Co., Ltd. 盘锦恒润生物技术开发有限公司, a limited liability company organized under the laws of the People’s Republic of China (“Panjin Hengrun”). DingXu BVI owns 99% of the total ownership of Panjing Hengrun. 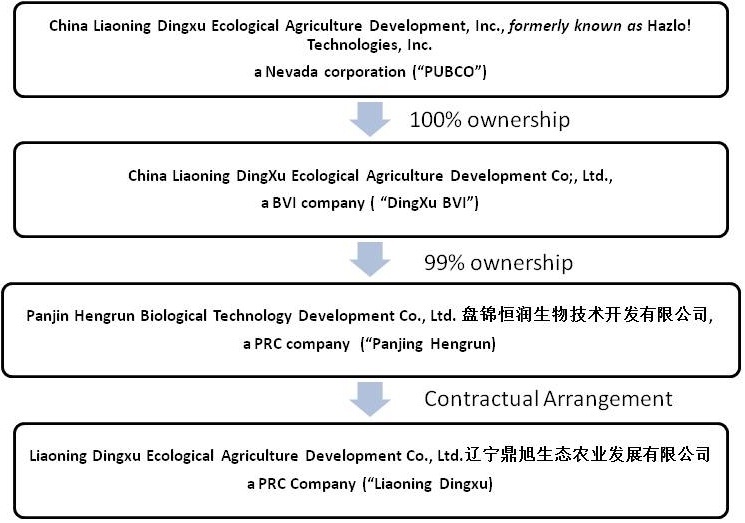 On November 28, 2011, Panjin Hengrun entered into a set of contractual arrangements with Liaoning Dingxu Ecological Agriculture Development Co., Ltd.辽宁鼎旭生态农业发展有限公司, a limited liability company organized under the laws of the People’s Republic of China and an affiliated entity of Panjin Hengrun through contractual arrangements (“Liaoning Dingxu”). The contractual arrangements are comprised of a series of agreements, including a Consulting Service Agreement and an Operating Agreement, through which Panjin Hengrun has the right to advise, consult, manage and operate Liaoning Dingxu to collect and own all of Liaoning Dingxu’s net profits and net losses. Additionally, under a Proxy Agreement, the shareholders of Liaoning Dingxu have vested their voting control over Liaoning Dingxu to Panjin Hengrun in order to further reinforce Panjin Hengrun’s rights to control and operate Liaoning Dingxu. Liaoning Dingxu and its shareholders have granted Panjin Hengrun, under an Option Agreement, the exclusive right and option to acquire all of their equity interests in Liaoning Dingxu, or, alternatively, all of the assets of Liaoning Dingxu. Further, the shareholders of Liaoning Dingxu agreed to pledge all of their rights, titles and interests in Liaoning Dingxu under an Equity Pledge Agreement. Upon entry of these contractual arrangements, Liaoning Dingxu became the Variable Interest Entity (“VIE”) of Panjin Hengrun pursuant to ASC-810-10-25. Panjin Hengrun was able to carry out business operations through Liaoning Dingxu. Liaoning Dingxu Ecological Agriculture Development Co., Ltd.辽宁鼎旭生态农业发展有限公司 (“Liaoning Dingxu”) was formed as a limited liability company organized under the laws of the People’s Republic of China on August 6, 2009. It mainly engages in the business of growing mushrooms and marketing mushroom and related agricultural products. Since the completion of the share exchange transaction, our business operations are carried out through Panjin Hengrun and its affiliated operating entity Liaoning Dingxu. On December 12, 2011, we ceased the business of development stage IT service and data translation services and started to engage in the business of growing mushrooms and marketing mushroom and related agricultural products through Liaoning Dingxu. We mainly engage in the business of growing mushrooms and marketing mushroom and related agricultural products through our affiliated variable interest entity Liaoning Dingxu. Fresh mushrooms. We grow fresh mushrooms in our farms and sell them to markets. Our fresh mushrooms include oyster mushrooms, king oyster mushrooms, king trumpet mushrooms, and button mushrooms. Mushroom growing products including mushroom spawns and mushroom sticks. Mushroom sticks are the stick shaped containers filled with fertilizers and the mushrooms grow on them. They are the growing bases for mushrooms. Our market is not seasonal due to the fact that our mushrooms are grown in the green house and therefore are not affected by season changes. We do need to store our fresh mushrooms, mushroom sticks and spawns in a low temperature environment. We mainly sell our mushroom spawns and sticks in Panjin City, Liaoning Province, China and the surrounding townships. We mainly sell our fresh mushrooms in north eastern Chinese cities including Shenyang, Anshan and Dalian. We conduct direct sales and marketing through our own sales team. We have not used agencies and brokers to sell our products. Our main customers are individual consumers. We do not have any written agreement with any customers and we do not rely on one or several major customers. The raw materials we use for growing our products include sawdust, straw, bran and chicken manure. Materials are collected from local farmers. We do not have any supply contract with any farmer. There are many mushroom producers and sellers in China and we only have a very small percentage of the total market in China. On a daily basis, we produce 2,500 kg fresh mushrooms, 8,000 mushroom sticks and 10,000 bottles of mushroom spawns. Our daily production is approximately 33% of our daily production capacity. Xinghe Biological Inc. located at Dongguan, Guangdong, has a 60 tons daily production capability and has approximately 8% of the markert share [in South China markets]. Gaorong Company, which is located in Shanghai, China, has a 100 tons daily production capability and has 10% market share in South China markets. These competitors are much larger than us. Expand our farms. We plan to obtain land use rights to more farmland to expand our mushroom farms and increase the production of our fresh mushrooms. Start the deep-processing production of our mushrooms and sell deep-processed products. We plan to purchase equipment and construct processing facilities to launch the production of deep-processed mushroom products, such as canned mushrooms and mushroom drinks. “Xianzhigu” register application number: ZC9880734SL. These laws and regulations set out safety and hygiene standards and requirements for various aspects of food production, such as the production, packaging, handling, labeling and storage of food and for the use of facilities and equipment that make food. Failure to comply with these laws and regulations may result in confiscation and destruction of our products and inventory, confiscation of proceeds from the sale of non-compliant products, fines, suspension of production and operations, product recalls, revocation of licenses, and, in extreme cases, criminal liability. Our farms are subject to various pollution control regulations with respect to water, air and noise pollution as well as the disposal of waste and hazardous materials. We are also subject to periodic inspections by local environmental protection authorities. Our operating subsidiary has received certifications from the relevant PRC government agencies in charge of environmental protection indicating that their business operations are in material compliance with the relevant PRC environmental laws and regulations. We are not currently subject to any pending actions alleging any violations of applicable PRC environmental laws. We did not incur research and development expenses in 2012. As of March 31, 2013, we had 53 employees, of which 36 are full-time. We file annual, quarterly and special reports, proxy statements and other information with the SEC. Our SEC filings are available to the public over the Internet at the SEC’s web site at http://www.sec.gov. You may also read and copy any document we file at the SEC’s Public Reference Room at 100 F Street, NE, Washington, DC 20549. You may obtain information on the operation of the Public Reference Room by calling the SEC at 1-800-SEC-0330. Not Applicable for Smaller Reporting Company. We have land use rights to 24,806 square meters of land in Xian town, Dawa County, Panjin City, LiaoNing Province, PRC. The term of the land use rights is 50 years, starting in March 2011, and the annual payment for the land use rights is $11,620. We have land use rights to 56,139 square meters of land in Xian town, Dawa County, Panjin City, LiaoNing Province, PRC. The term of the land use rights is 46 years, starting in March 2011, and the annual payment for the land use rights is $58,060. We have land use rights to 428,214 square meters of land in Xian town, Dawa County, Panjin City, LiaoNing Province, PRC. The term of the land use rights is 18 years, starting in January 2012, and the annual payment for the land use rights is $153,210. Under the 1982 Constitution, urban land in China is owned by the State and collectives own the rural land. Since the local and central governments administer the rural collectives, it can be construed that all land ownership is under control of the State. However, the Constitution's Amendment Act of 1988 to Article 10 adopted on April 12, 1988, states that a land use right may be transferred in accordance to law. Based on this statement, a land use right becomes divisible from land ownership, thus making land use right likely to be privatized. Individuals, including foreigners can hold long-term leases for land use. They can also own buildings, apartments, and other structures on land, as well as own personal property. Real estate transfers in China take place in the form of transfer of right to use land. To obtain land-use rights, the land user must sign a land-grant contract with the local land authority and pay a land-grant fee up front. The grantee will enjoy a fixed land-grant term and must use the land for the purpose specified in the land-grant contract. Depending on the type and purposes of land use, the maximum term of a land grant ranges from 40 years for commercial usage, 50 years for industrial purpose, to 70 years for residential use. The application of “Land Usage Right” on any leased land must be submitted to and approved by many authorities of the local and central government supported by a minimum of 80% of the signatories of its original land leasers who had leased the land from the government before they transfer the land to the new leasers. We are not a party to any legal proceedings that we believe will have a material adverse effect upon the conduct of our business or our financial position. The following table sets forth the range of high and low prices of our common stock as quoted on the over the counter market during the periods indicated. The prices reported represent prices between dealers, do not include markups, markdowns or commissions and do not necessarily represent actual transactions. As of May 13, 2013, there were 50 holders of record of our Common Stock, not including beneficial owners of our Common Stock whose shares are held in the names of various dealers, clearing agencies, banks, brokers and other fiduciaries. We did not pay any cash dividends on our common stock in the year ended December 31, 2012. We do not anticipate paying any cash dividends on our common stock in the foreseeable future. We currently intend to retain future earnings, if any, to finance operations and the expansion of our business. None in the year ended December 31, 2012. We mainly engage in the business of growing and marketing fresh mushroom, dried mushroom and mushroom crops and mushroom seeds through our affiliated variable interest entity LiaoNing DingXu. Fresh mushrooms. We grow fresh mushrooms in our greenhouse and sell them to markets. Our fresh mushrooms include oyster mushroom, king oyster mushroom, king trumpet mushroom, and button mushroom. The revenues from the sales of fresh mushrooms constitute approximately 62% and 55% of our total revenues in the fiscal year of 2012 and 2011, respectively. Mushroom crops and mushroom seeds. The revenues from the sales of mushroom crops and mushroom seeds approximately 28% and 45% of our total revenues in the fiscal year of 2012 and 2011, respectively. As the manufacture workshop completed in 2012, the Company have the capacity of the dried mushroom. The revenues from the sales of dried mushroom approximately 10% of our total revenues in the fiscal year of 2012. The following table presents an overview of assets, liabilities and shareholders’ equity as of December 31, 2012 and 2011. To date, our operations have been funded by contributions to “due to related parties” and the net cash provided by our fast developing operations. As a result, at December 31, 2012 we had $404,631 current assets, and $8,203,087current liabilities mainly consisted of the $2,386,445 Factory seed cultivation workshop constructing payment, the $492,085 payment for land use right, the $5,301,552 due to related party and others. We had working capital deficit of $7,798,456 as of December 31, 2012, which contains liquidity risk for the coming period. Although we believe management will continue to fund the Company on an as needed basis, we do not have a written agreement requiring such funding. For the due to related party, the shareholders promise that they would not demand repayment from the Company with in next fiscal year. We believe that our operation would have fast development in future which would provide sufficient net cash to fund our business. During the year ended December 31, 2012, we got a net profit $1,424,929 and our operating activities provided $2,403,001 in net cash. Over the long term, our expectation is to see a trend of growing sales for our mushroom series products, including fresh mushrooms, dried mushroom and mushroom crops and seeds, resulting from the improving of general agriculture industry, improving of the planting skills and the quality of our products, and the continuing encouragement from local government. As we continue to invest to develop our mushroom planting greenhouse and structures, mushroom seeds cultivation workshop and manufacturing workshop, the categories and total quantities of our products will be much higher than we produce now. The balance at the end of this period consisted of raw materials, growing crops and finished goods. The fresh mushroom in 2011 mainly came from local farmer and farming organizations as the business model includes cooperation with local farmers and farming organizations. As part of the greenhouse and planting structures under construction are completed, the company increased production of the fresh mushroom by themselves, which result in increase of growing crops compared to that as of December 31, 2011. As consistent with the policies, maintenance and repair costs are expensed as incurred, whereas significant renewals and betterments are capitalized. Construction in progress represents capital assets under construction or being installed and is stated at cost. Cost comprises original cost of plant and equipment, installation, construction and other direct costs prior to the date of reaching the expected usable condition. Construction in progress is transferred to the property, plant and equipment and depreciation commences when the asset has been substantially completed and reaches the expected usable condition. a. The building mainly represented the greenhouses, manufacturing workshops, warehouse, office building and supporting facilities, most of which were transferred from the construction in progress (CIP). b. The plant equipment represented the production equipment purchased from third parties. Prepayment made during 2011 $284,198 to purchase mushroom manufacturing production lines were transferred to fixed assets this year, hence we observed a significant increase of the plant compared to December 31, 2011.
c. The vehicles were the truck for transporting raw materials or finish goods. d. The office equipment represented for office computers, printers, desks and other office appliances. e. For the year ended December 31, 2012 and 2011, the Company recorded depreciation expense of $513,574 and $157,777, respectively. The Company states land use rights at cost less accumulated amortization. The land use right was used to build up greenhouse and planting structures, manufacturing workshop and other buildings. As of December 31, 2012 and 2011, the net values of land use rights are $5,768,262 and $3,225,474, respectively. The land use rights are amortized using the straight line method during the contract period. For the year ended December 31, 2012 and 2011, amortization expense amounted to $223,018 and 52,132, respectively. Leases where substantially all the risks and rewards of ownership of assets remain with the lessor are accounted for as operating leases. Payments made under operating leases net of any incentives received from the lessor are charged to the consolidated statements of operations on a straight-line basis over the terms of the underlying lease. The Company records lease payments at cost less accumulated amortization and amount that to be amortized within one year. The amount to be amortized within one year is recorded as current portion of prepaid leases. The Company entered into long term agreements with local government to rent land. The rental payments of $1,030,900 for the entire contract period are prepaid in 2011. The rental payments are recorded as operating lease expenses using the straight line method during the contract period of 20 years. Lease expense of $54,192 and $50,378 were recorded for the year ended December 31, 2012 and 2011. The Company became indebted to Bank of China in December 2011 for $476,122, payable in December 2012, interest at 8.46% per annum. The loan was repaid in full as of December 31, 2012. For the year ended December 31, 2012 and 2011, the Company recorded interest expense of $40,226 and $1,680, respectively. The balance at the end of this period mainly consisted of the $2,386,445 Factory seed cultivation workshop construction payment and the $492,085 payment for land use right and others. The total amount of due to related parties consisted of the borrowing of the shareholders. The shareholders lent $1,672,100 and $3,351,242 to the company for purchase the land use right to build greenhouse and planting structure in 2012 and 2011, respectively. The balance was $5,301,552 and $3,629,452 as of December 31, 2012 and 2011, respectively. The stockholders lent money without interest to the Company, the interest was valued at $357,240 and $156,306 for the year 2012 and 2011, respectively. The total of interest was reflected in the statement of operations as interest expenses in 2012 and 2011 with a corresponding contribution of paid-in capital. The shareholders’ equity increased from net profit in the year of 2012 and Unrealized foreign currency translation gain as the exchange rate changed. The following table presents an overview of our results of operation for the year ended December 31, 2012 and 2011. Sales revenue is recognized at the date of shipment from the Company’s facilities to customers when a formal arrangement exists, the price is fixed or determinable, the delivery is completed, ownership has passed, no other significant obligations of the Company exist and collectability is reasonably assured. We derived our revenues predominantly from sales of our fresh mushrooms, mushroom crops and seeds. For the year ended December 31, 2012 and 2011, revenues from sales of our fresh mushrooms sales were $5,384,972 and $2,418,018 respectively representing an increase of $2,966,954. Revenues from sales of our mushroom crops and seeds were $2,406,368 and $2,011,829 for the year ended December 31, 2012 and 2011, which indicated $394,539 increase. Revenues from sales of our dried mushroom were 825,836 for the year ended December 31, 2012, which also resulted in a sales increase. We started to open and run the business in the second half of 2009. In the years of 2009 and 2010, the company was still under a development stage with relatively low brand name recognition. The company began the mushroom sales in January of 2011, which led to lower amount of sales revenue in the year ended December 31, 2011 compared with 2012. For the year ended December 31, 2012, as the company progressed toward maturity, we strengthened our sales and marketing campaign which helped to enhance our brand name and increase our sales. The business model of cooperation with local farmers and farming organizations developed since local government encouraged the farmers to develop the local agriculture. As a result, our mushroom crops and seeds were also supported and welcomed by local farmers and farming organizations, which significantly increased our sales. As part of the greenhouse and planting structures under construction are completed, the categories and total quantities of our products are much higher than we produced in compared the year of 2011. As the manufacture workshop completed in 2012, the Company have the capacity of the dried mushroom, which increased the sales for the year of 2012. We expect to see a trend of growing sales for our mushroom series products, including fresh mushroom & mushroom crops and seeds, resulting from the growing of the market scales, improving of general agriculture industry, improving of the planting skills and the quality of our products, and the continuing encouragement from local government. The following table presents a breakdown of our cost of revenue of fresh mushroom and mushroom crops and seeds for the year ended December 31, 2012 and 2011. Cost of fresh mushrooms sales: Our cost of fresh mushrooms sales consists primarily of costs associated with purchased materials, growing cost and purchased fresh mushroom from farmers or farming organizations. Cost of fresh mushrooms sales are allocated to each kind of mushroom using the specific identification method. Costs are allocated to specific units within a product based on the ratio of the sales quantities of the specific units to the total sellable quantities of the product. Cost of mushroom crops and seeds sales: Our cost of mushroom crops and seeds sales mainly represented the costs of purchased and cultivate seeds or crops. We used our workshop to cultivate well mushroom seeds or crops and sold them to local farmers or farming organizations. We also purchased some good quality mushroom seeds from third party and sold them to our customers as well after our selection. The costs are as well allocated to specific units within a product based on the ratio of the sales quantities of units to the total sellable quantities of the product. Cost of dried mushrooms sales: Our cost of dried mushrooms sales consists primarily of costs associated with fresh mushroom and manufacture expense. Cost of dried mushrooms sales are allocated to each kind of mushroom using the specific identification method. Costs are allocated to specific units within a product based on the ratio of the sales quantities of the specific units to the total sellable quantities of the product. Gross profit from our mushroom growing business increased by $ 1,625,558 for the year ended December 31, 2012 compared to the year of 2011. The increase was a primary result from cumulative effect of our business development and sales volume increase. The gross margin of our Fresh mushrooms increased from 24.01% for the year ended December 31, 2011 to 35.22% of 2012 benefit from economies of scale. And the gross margin of our mushroom crops and seeds decreased from 36.74% for the year ended December 31, 2011 to 31.50% of 2012 because that we reduced the oyster mushroom seeds price to encourage the local farmers and farming organizations cooperation with us. The dried mushroom, the purpose of which is usually used as gift, have large added value. For the year ended December 31, 2012, our Depreciation and amortization were $561,383, representing an increase of $409,764, as compared to that for the year of 2011. The increase was primarily a result of increased fixed assets and land use right. The bad debt represented an $460,530 of allowance for doubtful receivable account which were the staff borrowing whose aging over 3 months and allowance for prepaid expense due from supplier. Other income is used to record the company’s non operating income, such as government grant. For the year ended December 31, 2012, the other income included the USD $373,843 from the government grant for encourage developing local agriculture. For the year of 2011, the impairment loss included USD $313,783, which was composed of $92,050 in software and $221,733 in fixed assets impairment. Taxation on profits earned in the PRC has been calculated on the estimated assessable profits for the year at the rates of taxation prevailing in the PRC where the Company operates after taking into effect the benefits from any special tax credits or “tax holidays” allowed in the county of operations. The Company does not accrue United States income tax since it has no operating income in the United States. The Operating subsidiary is organized and located in the PRC and do not conduct any business in the United States. In accordance with the relevant tax laws in the PRC, as an agriculture growing enterprise, the Operating subsidiary is exempted from corporate income tax from 2010 to 2012. Accordingly, the company statutory rate was 0% and 0% for the year ended December 31, 2012 and 2011. The following table presents selected cash flow data from our cash flow statements for the year ended December 31, 2012 and 2011, respectively. Net cash provided by operating activities for the year ended December 31, 2012 was $2,403,001 which was primarily due to (i) an increase of the net income $1,424,929 and (ii) a total increase of $736,592 of the depreciation and amortization of fixed assets, land use right and (iii) an increase of the bad debt $460,530 and (iv) an increase of the imputed interest $357,420 and (v) a total decrease of $576,290 of the changes in assets and liabilities. Net cash used in operating activities for the year ended December 31, 2011 was $1,384,615, which was primarily due to (i) a decrease of the net income $172,976 and (ii) a total increase of $222,378 of the depreciation and amortization of fixed assets, land use right and (iii) an increase of the bad debt $372,010 and (iv) an increase of the impairment loss 313,783 and (v) an increase of the imputed interest $156,306 a (iv) a total decrease of $2,276,116 of the changes in assets and liabilities. Net cash used in investing activities was $3,654,684 for the year ended December 31, 2012, which was primarily attributable to (i) an investment of $1,649,206 for the fixed assets and (ii) an investment of $58,194 for the construction in progress to build greenhouse and (iii)an investment of $1,947,284 for the acquisition of land use right. Net cash used in investing activities was $9,638,177 for the year ended December 31, 2011, which was primarily attributable to (i) an investment of $1,025,410 for the construction in progress to build greenhouse, manufacture workshop and others and (ii) an investment of $6,778,045 for the fixed assets and (iii) an investment of $1,742,672 for the acquisition of land use right and (iv) an investment of $92,050 for the software. Net cash provided by financing activities was $1,195,9778 for the year ended December 31, 2012, which was mainly attributable to (i) a total $1,672,100 of the current account from a related party and (ii) a total $476,122 payment for the short-term loan. Net cash provided by financing activities was $10,805,842 for the year ended December 31, 2011, which was mainly attributable to (i) a total $6,953,458 from capital injection of shareholders and (ii) a total $3,351,262 of the current account from a related party and (iii) a total $476,122 from short-term bank loan and (iv)a total $25,000 from share issuances. The preparation of financial statements in conformity with US GAAP requires management to make estimates and assumptions that affect the reported amounts of assets and liabilities and disclosure of contingent assets and liabilities at the date of the financial statements and the reported amounts of revenues and expenses during the reporting period. In the opinion of management, all adjustments necessary in order to make the financial statements not misleading have been included. Actual results could differ from those estimates. Inventories are stated at the lower of cost or market value. Cost is determined using moving weighted average method. Inventories consist of raw materials, finished goods and growing crops. Cost of finished goods comprises direct material, direct production cost based on normal operating capacity. The Company’s revenue consists of the invoiced value of goods, net of value-added tax (“VAT”). The functional currency of the Company is the RMB and the RMB is not freely convertible into foreign currencies. The Company maintains its financial statements in the functional currency. Monetary assets and liabilities denominated in currencies other than the functional currency are translated into the functional currency at rates of exchange prevailing at the balance sheet date. Transactions denominated in currencies other than the functional currency are translated into the functional currency at the exchange rates prevailing at the dates of the transactions. Exchange gains or losses arising from foreign currency transactions are included in the determination of net income for the respective periods. For financial reporting purposes, the financial statements of the Company, which are prepared using the functional currency, have been translated into United States dollars. Assets and liabilities translated at exchange rates at the balance sheet date, revenue and expenses are translated at the average exchange rates for the period, and members' equity is translated at historical exchange rates. Translation adjustments are included in accumulated other comprehensive income, a component of members’ equity. Accumulated other comprehensive income represents the change in equity of the Company during the periods presented from foreign currency translation adjustments. The Company does not accrue United States income tax since it has no operating income in the United States. The Company is organized and located in the PRC and do not conduct any business in the United States. The Provisional Regulations of The People’s Republic of China Concerning Value Added Tax promulgated by the State Council came into effect on January 1, 1994. Under these regulations and the Implementing Rules of the Provisional Regulations of the PRC Concerning Value Added Tax, value added tax is imposed on goods sold in or imported into the PRC and on processing, repair and replacement services provided within the PRC. In accordance with the relevant tax laws in the PRC, as an agriculture growing enterprise, the Operating subsidiary is exempted from VAT for the year ended December 31, 2012 and 2011. Maintenance and repair costs are expensed as incurred, whereas significant renewals and betterments are capitalized. The Company states land use rights at cost less accumulated amortization. The land use rights are amortized on straight line method during the contract period. On August 22, 2012, the Company dismissed its independent registered public accounting firm Stan J.H. Lee, CPA (“Stan Lee”). The decision to dismiss Stan Lee was adopted by the Board of Directors of the Company. None of the reports of Stan Lee, on the Company's financial statements for either of the past two fiscal years or subsequent interim periods contained an adverse opinion or disclaimer of opinion, or was qualified or modified as to uncertainty, audit scope or accounting principles. 3) the scope of the audit should be expanded significantly, or information has come to the attention of Stan Lee that if further investigated may materially impact the fairness or reliability of a previously issued audit report or the underlying financial statements, or the financial statements issued or to be issued covering the fiscal year ended December 31, 2012. On August 23, 2012, the Company engaged M&K CPAS, PLLC (“M&K”) as its principal accountant to audit the Company's financial statements. M&K was the Company’s independent registered public accounting firm during the fiscal year ended September 30, 2011 and the period from August 19, 2010 to September 30, 2010. During the fiscal years ended September 30, 2011, the period from August 19, 2010 to September 30, 2010 and the interim period through December 6, 2011, the reports of M&K for the year ended September 30, 2011 and the period from August 19, 2010 to September 30, 2010 did not contain an adverse opinion or disclaimer of opinion and were not qualified or modified as to uncertainty, audit scope or accounting principles other than going concern. We maintain “disclosure controls and procedures,” as such term is defined in Rule 13a-15(e) under the Securities Exchange Act of 1934 (the “Exchange Act”), that are designed to ensure that information required to be disclosed in our Exchange Act reports is recorded, processed, summarized and reported within the time periods specified in the Securities and Exchange Commission rules and forms, and that such information is accumulated and communicated to our management, including our Chief Executive Officer and Chief Financial Officer, as appropriate, to allow timely decisions regarding required disclosure. We conducted an evaluation (the “Evaluation”), under the supervision and with the participation of our Chief Executive Officer (“CEO”) and Chief Financial Officer (“CFO”), of the effectiveness of the design and operation of our disclosure controls and procedures (“Disclosure Controls”) as of the end of the period covered by this report pursuant to Rule 13a-15 of the Exchange Act. In designing and evaluating the disclosure controls and procedures, we recognized that a control system, no matter how well designed and operated, can provide only reasonable, not absolute, assurance that the objectives of the control system are met. Because of the inherent limitations in all control systems, no evaluation of controls can provide absolute assurance that all control issues and instances of fraud, if any, within a company have been detected. Based upon the required evaluation, our CEO and CFO concluded that as of December 31, 2012, the Company’s disclosure controls and procedures were not effective to ensure that information required to be disclosed by the issuer in the reports that it files or submits under the Act (15 U.S.C. 78a et seq.) is recorded, processed, summarized and reported, within the time periods specified in the Commission's rules and forms due to the material weakness described below. Disclosure controls and procedures include, without limitation, controls and procedures designed to ensure that information required to be disclosed by an issuer in the reports that it files or submits under the Act is accumulated and communicated to the issuer's management, including its principal executive and principal financial officers, or persons performing similar functions, as appropriate to allow timely decisions regarding required disclosure. Our management is responsible for establishing and maintaining adequate internal control over financial reporting, as such term is defined in Exchange Act Rule 13a-15(f). The Company’s internal control over financial reporting is a process designed to provide reasonable assurance to our management and board of directors regarding the reliability of financial reporting and the preparation of the financial statements for external purposes in accordance with accounting principles generally accepted in the United States of America. As a result, we performed additional analysis and other post-closing procedures to ensure our consolidated financial statements were prepared in accordance with generally accepted accounting principles. Accordingly, management believes the consolidated financial statements included in this Form 10-K fairly present, in all material respects, our financial condition, results of operations and cash flows for the periods presented. The following sets forth information regarding the directors and executive officers of the Company as December 31, 2012. Chin Yung Kong, a Malaysian citizen, age 60, resides in Dalian, China. Mr. Chin has served as the Company’s President, Secretary, Treasurer and sole director since December 2012. Mr. Chin is the Managing Director of QMIS Capital Finance. Since 2002 Mr. Chin has devoting most of his time advising Chinese clients on financial restructuring, pre-audit evaluation before going public, pre-IPO investment strategies, and on the process of going public in the United States. From 1995 to 2002, Mr. Chin was financial controller for the Kwok Group Company in China. Prior to 1995 Mr. Chin was a practicing auditor and Certified Public Accountant (CPA) with Foo Kon & Tan in Singapore. Mr. Chin graduated from University of Hull in the United Kingdom with a Masters degree in Finance. Mr. Chin provides financial and strategic expertise to the Company as a member of its board of directors. The Company does not have an employment agreement with Mr. Chin, our only executive officer. All directors have a term of office expiring at the next annual general meeting of the Company, unless re­elected or earlier vacated in accordance with our bylaws. All officers have a term of office lasting until their removal or replacement by the board of directors. We have not yet implemented any board committees. We do not have a standing audit committee, an audit committee financial expert, or any committee or person performing a similar function. If we are able to raise sufficient financing in the future, then we will likely seek out and retain independent directors and form an audit, compensation committee and other applicable committees. As of December 31, 2012, none of our officers, directors and greater than 10 percent shareholders have filed the reports under Section 16(a). Our bylaws provide that we will indemnify our directors and officers to the fullest extent permitted by the Nevada corporation laws. There is no pending litigation or proceeding naming any of our directors or officers to which indemnification is being sought, and we are not aware of any pending or threatened litigation that may result in claims for indemnification by any director or officer. Since inception, we have paid no cash or non-cash executive compensation (including stock options or awards, perquisites, or deferred compensation plans), whatsoever, to the officers or directors. The following table sets forth certain information concerning the number of Company common shares owned beneficially by: each person known or believed by us to own, directly or beneficially, more than 5% of our common stock, each of our directors, and all of our officers and directors as a group. Unless otherwise indicated, the stockholders listed possess sole voting and investment power with respect to the common shares shown. Unless otherwise indicated, the Company has been advised that all individuals listed have the sole power to vote and dispose of the number of Shares set forth opposite their names. For purposes of computing the number and percentage of Shares beneficially owned by a stockholder, any shares which such person has the right to acquire within 60 days are deemed to be outstanding, but those shares are not deemed to be outstanding for the purpose of computing the percentage ownership of any other stockholder. Based on 46,450,000 Shares issued and outstanding as of May 15, 2013. The share exchange agreement and the underlying transaction that we carried out on December 12, 2011 is a related transaction because the shareholder of Dingxu BVI, Mr. Chin Yung Kong, is our current officer and director and majority shareholder. On January 08, 2013, Chin Yung Kong cancelled 20,000,000 shares of common stock. We do not currently have a formal related party approval policy for review and approval of transactions required to be disclosed pursuant to Item 404(a) of Regulation S-K.
We do not have any independent Director as defined under NASDAQ Marketplace Rule 4200(a)(15). The following materials from our Annual Report on Form 10-K for the year ended December 31, 2011, formatted in XBRL (eXtensible Business Reporting Language): (i) the Consolidated Balance Sheets, (ii) the Consolidated Statements of Operations, (iii) the Consolidated Statements of Stockholders' Equity (iv) the Consolidated Statements of Cash Flows, and (v) Notes to Consolidated Financial Statements. **Incorporated by reference to the Form 8-K Current Report filed on December 13, 2011. *** Incorporated by reference to the Form 8-K Current Report filed on August 9, 2012. **** XBRL information is furnished and not filed or a part of a registration statement or prospectus for purposes of sections 11 or 12 of the Securities Act of 1933, as amended, is deemed not filed for purposes of section 18 of the Securities Exchange Act of 1934, as amended, and otherwise is not subject to liability under these sections. We have audited the accompanying consolidated balance sheets of China Liaoning Dingxu Ecological Agriculture Development, Inc. as of December 31, 2012 and 2011 and the related consolidated statements of operations, changes in stockholders' equity and cash flows for each of the twelve month periods then ended. These consolidated financial statements are the responsibility of the Company’s management. Our responsibility is to express an opinion on these consolidated financial statements based on our audits. We conducted our audits in accordance with standards of the Public Company Accounting Oversight Board (United States). Those standards require that we plan and perform the audit to obtain reasonable assurance about whether the consolidated financial statements are free of material misstatement. The Company is not required to have, nor were we engaged to perform, an audit of its internal control over financial reporting. Our audit included consideration of internal control over financial reporting as a basis for designing audit procedures that are appropriate in the circumstances, but not for the purpose of expressing an opinion on the effectiveness of the Company's internal control over financial reporting. Accordingly, we express no such opinion. An audit includes examining, on a test basis, evidence supporting the amounts and disclosures in the consolidated financial statements. An audit also includes assessing the accounting principles used and significant estimates made by management, as well as evaluating the overall financial statement presentation. We believe that our audits provide a reasonable basis for our opinion. In our opinion, the consolidated financial statements referred to above present fairly, in all material respects, the financial position of China Liaoning Dingxu Ecological Agriculture Development, Inc. as of December 31, 2012 and 2011, and the results of its operations and cash flows for the periods described above in conformity with accounting principles generally accepted in the United States of America. As discussed in Note 18 to the financial statements, the 2011 financial statements have been restated to correct errors in the financial statements. CHINA LIAONING DINGXU ECOLOGICAL AGRICULTURE DEVELOPMENT INC.
China Liaoning Dingxu Ecological Agriculture Development Inc. (the "Company") was incorporated under the laws of State of Nevada on August 19th, 2010. The Company is primarily engaged in the growing and selling of agriculture products in People’s Republic of China (“PRC”). On December 12, 2011, the Company entered a Share Exchange Agreement with DingXu BVI Shareholder (Chin Yung Kong) under which the Company issued 60,000,000 shares of common stock to Chin Yung Kong to acquire 100% of the issued and outstanding shares of DingXu BVI. China Liaoning DingXu Ecological Agriculture Development Co, Ltd., a BVI company (the “DingXu BVI”) was incorporated under the laws of British Virgin Islands on April 15, 2011. Chin Yung Kong was the sole shareholder and director of DingXu BVI. On July 5, 2011, DingXu BVI formed Panjin Hengrun Biological Technology Development Co, Ltd., a limited liability company organized under the laws of the People’s Republic of China (“Panjin Hengrun”). DingXu BVI owns 99% of the total ownership of Panjing Hengrun. On November 28, 2011, Panjin Hengrun entered into a set of contractual arrangements with Liaoning Dingxu Ecological Agriculture Development Co., Ltd., a limited liability company organized under the laws of the People’s Republic of China and an affiliated entity of Panjin Hengrun through contractual arrangements (“Liaoning Dingxu”). The contractual arrangements are comprised of a series of agreements, including a Consulting Service Agreement and an Operating Agreement, through which Panjin Hengrun has the right to advise, consult, manage and operate Liaoning Dingxu to collect and own all of Liaoning Dingxu’s net profits and net losses. Additionally, under a Proxy Agreement, the shareholders of Liaoning Dingxu have vested their voting control over Liaoning Dingxu to Panjin Hengrun. In order to further reinforce Panjin Hengrun’s rights to control and operate Liaoning Dingxu. Liaoning Dingxu and its shareholders have granted Panjin Hengrun, under an Option Agreement, the exclusive right and option to acquire all of their equity interests in Liaoning Dingxu, or, alternatively, all of the assets of Liaoning Dingxu. Further, the shareholders of Liaoning Dingxu agreed to pledge all of their rights, titles and interests in Liaoning Dingxu under an Equity Pledge Agreement. Upon entry of these contractual arrangements, Liaoning Dingxu became the Variable Interest Entities (“VIE”) of Panjin Hengrun pursuant to FIN 46 (R) and Panjin Hengrun was able to carry out business operations through Liaoning Dingxu. These financial statements and related notes are presented in accordance with accounting principles generally accepted in the United States of America (“US GAAP”). The company maintains its books and accounting records in Renminbi (“RMB”), and its reporting currency is United States dollars. The Company considers all highly liquid investments with maturity of three months or less when purchased to be cash equivalents. The Company recroded cash balance of $21,245 and $31,863 for the year ended December 31, 2012 and 2011, respectively. Company did not have cash equivalent as of December 31, 2012 and 2011. Inventories are stated at the lower of cost or market value. Cost is determined using moving weighted average method. Inventories consist of raw materials, finished goods and growing crops. Cost of finished goods comprises direct material and direct production cost based on normal operating capacity. The Company states land use right at cost less accumulated amortization. The land use right is amortized on straight line method during the contract period. The Company has land use rights to 24,806 square meters of land. The term of the land use rights is 50 years, starting in March 2011. The land use right in the amount of $579,580 was fully paid during 2011. For the year ended December 31, 2012 and 2011, the Company recorded amortization expense of $11,620 and $8,694, respectively. The Company recorded the land use right net value of $560,664 and $570,886 as of December 31, 2012 and 2011 respectively. The Company has land use rights to 56,139 square meters of land. The term of the land use rights is 46 years, starting in March 2011. The land use right in the amount of $2,698,027 was not yet fully paid for as of December 31, 2012. Company recorded liabilities related to this land use right in the amount of $491,926 and $1,222,048 as of December 31, 2012 and 2011 respectively. For the year ended December 31, 2012 and 2011, the Company recorded amortization expense of $58,060 and $43,439, respectively. The Company recorded the land use right net value of $2,603,032 and $2,654,588 as of December 31, 2012 and 2011 respectively. The Company has land use rights to 428,214 square meters of land. The term of the land use rights is 18 years, starting in January 2012. For the year ended December 31, 2012, the Company recorded amortization expense of $153,210. The Company recorded the land use right net value of $2,757,776 as of December 31, 2012. As the land use right was not yet fully paid for as of December 31, 2012, the Company recorded long term liabilities related to this land use right in the amount of $1,548,644 as of December 31, 2012. The Company records lease payments at cost less accumulated. The Company entered into long term agreements with certain unrelated parties to rent land. The lease payments are recorded as operating lease expenses using the straight line method during the contract period of 20 years. The lease payments for the entire contract period in the amount of $1,030,900 were prepaid during 2011. For the year ended December, 2012 and 2011, the Company recorded lease expense of $54,192 and 50,378, respectively. Company recorded prepaid lease expenses at net, in the amount of$879,470 and 931,448 as of December 31, 2012 and 2011 respectively. Sales revenue is recognized at the date of shipment from the Company’s facilities to customers when a formal arrangement exists, the price is fixed or determinable, the delivery is completed, ownership has passed, no other significant obligations of the Company exist and collectibility is reasonably assured. The Company currently has no warranty or return policy as all sales are final. In accordance with the relevant tax laws in the PRC, as an agriculture growing enterprise, the operating subsidiary is exempted from enterprise income tax from 2010 to 2012. Accordingly, the Company statutory rate was 0% and 0% for the year ended December 31, 2012 and 2011, respectively. In accordance with the relevant tax laws in the PRC, as an agriculture growing enterprise, the Company is exempted from VAT from 2010 to 2012. The reporting currency of the Company is the U.S. dollar. The functional currency of the parent company is the U.S. dollar and the functional currency of the Company’s operating subsidiaries and variable interest entities is the RMB. For the subsidiaries and variable interest entities whose functional currencies are the RMB, results of operations and cash flows are translated at average exchange rates during the period, assets and liabilities are translated at the unified exchange rate at the end of the period, and equity is translated at historical exchange rates. Translation adjustments resulting from the process of translating the local currency financial statements into U.S. dollars are included in determining comprehensive income. Transaction gains and losses that arise from exchange rate fluctuations on transactions denominated in a currency other than the functional currency are included in the results of operations as incurred. All of the Company’s revenue transactions are transacted in the functional currency. The Company does not enter any material transaction in foreign currencies and accordingly, transaction gains or losses have not had, and are not expected to have, a material effect on the results of operations of the Company. In accordance with ASC Topic 230, cash flows from the Company’s operations are calculated based upon the local currencies using the average translation rate. As a result, amounts related to assets and liabilities reported on the statement of cash flows will not necessarily agree with changes in the corresponding balances on the balance sheets. In February 2013, the FASB issued ASU 2013-02, “Comprehensive Income (Topic 220): Reporting of Amounts Reclassified Out of Accumulated Other Comprehensive Income.” This ASU does not change the current requirements for reporting net income or other comprehensive income in financial statements. However, this guidance requires an entity to provide information about the amounts reclassified out of accumulated other comprehensive income by component. In addition, an entity is required to present, either on the face of the statement, where net income is presented or in the notes, significant amounts reclassified out of accumulated other comprehensive income by the respective line items of net income but only if the amount reclassified is required under U.S. GAAP to be reclassified to net income in its entirety in the same reporting period. For other amounts that are not required under U.S. GAAP to be reclassified in their entirety to net income, an entity is required to cross-reference to other disclosures required under U.S. GAAP that provide additional detail about those amounts. For public entities, the guidance is effective prospectively for reporting periods beginning after December 15, 2012. For nonpublic entities, the guidance is effective prospectively for reporting periods beginning after December 15, 2013. Early adoption is permitted. The adoption of this standard is not expected to have a material impact on the Company’s consolidated financial position and results of operations. In July 2012, the FASB issued ASU 2012-02, “Intangibles-Goodwill and Other (Topic 350): Testing Indefinite-Lived Intangible Assets for Impairment.” This ASU simplifies how entities test indefinite-lived intangible assets for impairment, which improves consistency in impairment testing requirements among long-lived asset categories. These amended standards permit an assessment of qualitative factors to determine whether it is more likely than not that the fair value of indefinite-lived intangible assets is less than their carrying value. For assets in which this assessment concludes it is more likely than not that the fair value is more than its carrying value, these amended standards eliminate the requirement to perform quantitative impairment testing as outlined in the previously issued standards. The guidance is effective for annual and interim impairment tests performed for fiscal years beginning after September 15, 2012. Early adoption is permitted. The adoption of this standard is not expected to have a material impact on the Company’s consolidated financial position and results of operations. Inventories consist of raw materials, finished goods, and growing crops. Raw materials that were not put into production as of fiscal year end were stated at lower cost or market. Company recorded raw material of $16,781 and $nil as of December 31, 2012 and 2011 respectively. As fresh mushroom were perishable goods, finished goods consist of dried mushroom at fiscal year end. Company recorded dried mushroom finished goods of $63 and $nil as of December 31, 2012 and 2011 respectively. Growing crops consist are valued at the lower of cost or market and are deferred and charged to cost of goods sold when the related crop is harvested and sold. The deferred growing costs included in inventory in the consolidated balance sheets consist primarily of raw material of the crops, direct labor, depreciation of fixed assets used directly in growing, land lease payment for the field used to grow crops, and utilities used in the production site. Cost included in growing crops related to the current crop year. For the year ended December 31, 2012 and 2011, the Company recorded depreciation expense of $513,574 and $157,777, respectively. For the year ended December 31, 2011, the Company recorded impairment loss of $313,783, which included a write off of software in the amount of $92,050 and fixed assets in the amount of $221,733.